A recent article in Consumer Reports compared average fees charged by banks versus credit unions and the results are startling. 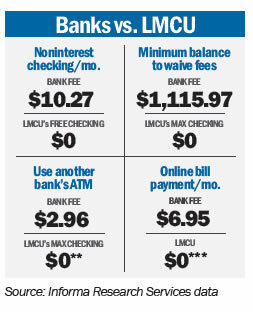 When it comes to fees, credit unions either don’t have some of the same fees charged by banks or charge significantly less. And when comparing Lake Michigan Credit Union to banks-see the list to the right-the savings and added value to you, our member, are dramatic. Our Max Checking account, for instance, is free, with no minimum balance requirements and no monthly fees, plus you can earn 3 % APY*, on balances up to $15,000. Stop by any branch or visit us online for more information. *Annual Percentage Yield. Dividends not paid on balances above $15K. Rate subject to change.Some requirements apply. **Up to $15 in surcharge ATM fee refunds per month.